Here’s Theatre Intangible podcast 93: Evans/Laplante/Schenker/Sevits, starring Peter Evans, Travis Laplante, Craig Schenker, and Jamison Sevits. New York free improvisation artists Peter Evans and Travis Laplante performed a show at Noa Noa on May 15th, 2012 organized by Nashville’s Craig Schenker. See excerpts of their solo sets in the videos below. 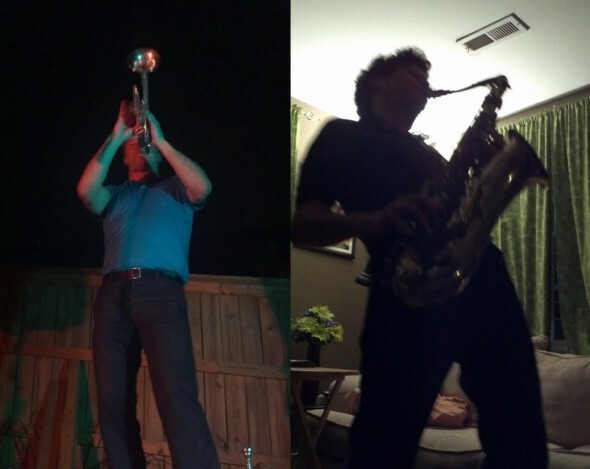 After the show, we recorded this incendiary improv, featuring Peter Evans on trumpet, Travis LaPlante on saxophone, Craig Schenker on saxophone, Jamison Sevits on trumpet, and all four on various woodwinds. I did the recording, live mixing, editing, and mastering. Travis LaPlante plays in the band Little Women, as a solo saxophonist, and with the tenor saxophone quartet Battle Trance. His solo album Heart Protector released to rave reviews in 2011, and Little Women’s brand new album Lung is available now at aumfidelity.com. Peter Evans plays with the Peter Evans Quartet, International Contemporary Ensemble, Alarm Will Sound, Continuum, and Ensemble 21, as a solo saxophonist, and with many jazz luminaries, including Peter Brotzmann, Evan Parker, Mary Halvorson Fred Frith, and Weasel Walter. He just released the debut recording of his “Zebulon” trio with John Hébert and Kassa Overall, recorded at and named after the now defunct Brooklyn club. It’s available on MoreIsMoreRecords.com.